The researchers at Deutsche Bank (s db) are throwing out old estimates of the worldwide mobile phone market because they say we’re still underestimating its size. The reason? They’re still trying to grasp how many cell phones are made and sold in China. As a result, Deutsche Bank is increasing its 2011 forecast of the worldwide market to 1.68 billion phones, up from 1.57 billion earlier this year. “The bulk of this change comes from an additional 115 million GSM 2G units going into emerging markets,” a research note from the firm says.The problem with counting the phones sold in China is that a sizable chunk of them are “Shanzhai” phones, or knock-off phones that are cheap to make and popular in China and in neighboring emerging markets. The manufacturers of these handsets don’t have official licenses to build phones from the Chinese government and typically do not sell them through what we might think of as traditional retail channels. But even though Deutsche Bank has talked to contacts in the country to get a better feel for the true number of phones being made and sold, it says it’s still difficult to know the true size. “It’s also worth pointing out that we could still be missing some number of shanzhai phones…In a note following our recent China trip, we pointed out that many of the China handset makers sell $20 phones. These go to emerging markets prepaid customers, and we know no data source capable of tracking these units,” Deutsche Bank said. Zeroing in on the true size of that market is not the only factor increasing this year’s forecast though. Phones using LTE technology are rolling out faster than anticipated in the U.S. Previously, Deutsche Bank was expecting 3 million LTE phones this year, now it’s doubling that number. In addition to the worldwide numbers in basic handsets growing, consumers still just can’t get enough of smartphones. Smartphones shipments will grow by 30 percent this year over 2010 levels to a total of 423 million units, with Android(s goog) phones accounting for 220 million of those, Apple iOS(s aapl) phones for 80 million, Nokia 70 million(s nok), and Research in Motion(s rimm) selling 50 million BlackBerry handsets, according to Deutsche Bank. This year’s growth isn’t expected to slow any time soon either. 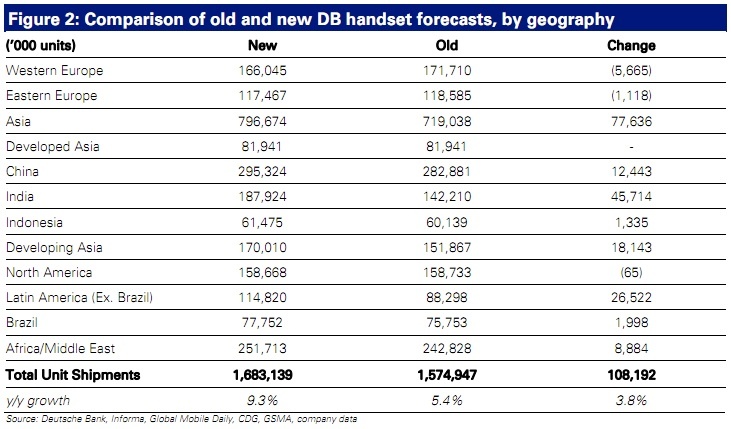 DB is upping its estimate for smartphone growth in 2012 too. Anticipating smartphone prices to drop below $150 next year, the group is expecting overall unit sales growth to hit 36 percent.